Logain Industries has developed Production Modules which enable Docks, TL & M1 class ships to produce wares. Using Nano Production Technologies modules are able to replicated traditional station production. PM has three main functions, Production, Salvage and Repair. PMv7 requires Community Plugin Configuration by Cycrow. PM uses the AL Plug-in. Logain Industries has developed Production Modules which enable Docks and TL/M1class ships to produce wares. Using Nano Production Technologies modules are able to replicated traditional station production. Salvaging is the only Module task which does not use grouping, one salvage task = 1 Module. Grouping is achieved by creating a Parent & Child relationship between Modules completing the same task. This is the first Module configured to run a production task, all additional Modules added to complete the same task will inherit the settings and status of the Parent Module. The Parent Module is checked each production cycle and if it fails all Child Modules will also fail. Any Child Module added will not contribute to the current production cycle. Are automatically added to a Parent Module if they are completing the same task and they will inherit their Parent Module status and settings. However the Child Module is individually checked each production cycle. If the production cycle is running with no issues the Parent Module will display the remaining time of the cycle. Production Modules mimic the production of Wares, Ships, Stations and Ship Equipment based on the blueprint selected. The production will run continually until cleared by the user. Salvage takes a physical Ship, Station or Ship Equipment and converts it to raw resources; this process will also build a local Blueprint of the item to enable Production. Unlike the Production task, Salvaging will only run once and release the Module when complete. Ships – Will be salvaged, stripped of all wares and added as a Blueprint if one does not exist. Stations – Will be salvaged, and added as Blueprint if one does not exist, the Station product will also be added as a Blueprint if ones does not exist. resources required depend on damage and the repair time is dependant on the damage and the number of Modules committed to the repair task. Blueprints are created at stored locally when a Ship, Station or Ship Equipment is salvaged. They hold the build details required to produce the item. Shield Production Complex produce two types of shields for each level, Light, Medium & Heavy. PM will select the first product to create a Blueprint; the station will need to be salvage again to create the second product Blueprint. The second salvage task should not be started until the first is complete. Production Complexes are specifically designed to support a large number of concurrent Modules and increased storage capacity. The player will require increasing standings with a race to buy each Complex. Vanilla Docks can support 40 concurrent Modules but they are limited by their storage. By default M1, TL class ships and Docks other then the Production Complexes are not registered as PM enabled. They can be added via the Configuration Menu. Docks are added by type, Ships are added individually. By default the storage usage can be governed by setting a production cap against the produced product. When the cap is reached the production will be automatically paused and restarted as required. This sets a local limit against the produced product which will maintained that level before passing surplus a selected FDN Node, or out into FDN INN (Inter Node Networking). This lists all FDN Node enabled docks in INN range, each Node can be selected at any time. If the Producing Station is itself an FDN enabled Node it will also be listed and selectable. This list all ware held at the linked FDN Node, the ware settings at the Node can also be accessed & updated via this list. All three can be used to manage the production, access and distribution levels. If the producing station is its own default Node it is recommended that the Maintain Local levels & FDN Ware levels match to minimise any player confusion. However it is not required by PM or FDN as the supply logic will calculate and use the best option. When the player opens the PM Main Menu or Configuration Menu all player docks are checked and if there is a dummy dock deployed it will be replaced by the appropriate HQ version. The configuration menu allows you to enable PM features on vanilla/custom docks and M1/TL class ships. Debug logging can also be turned on/off for the main PM processes. PM can also be fully reset from this menu; this will terminate all PM tasks and clear all local & global variables. Credit and resource requirements for Ship & Station Production and Salvaging can be modified in the configuration menu. Removing credit and resource requirements will be offset by increased Energy Cell requirements. The default race can be set here, this affects the race specific wares required to build Ship Equipment. Last edited by Logain Abler on Mon, 25. Apr 11, 14:27, edited 240 times in total. mutantmessiah wrote: Looking forward to this one. The modules will integrate with my FDN mod (if in range) or will need to be supplied by more traditional routes..
Hmm, I can imagine using assistant drones and this to turn arans into mobile supply bases. Awesome, so the big boys can pump out better stuff for us. Could you set it up based on maximum cargo space, available to any ship with a 5k plus cargo hold? One module for 5k, 2 for 10k, 3 for 20k, 4 for 40k etc... I have no idea how scripting works, so if that was completely ridiculous I apologize. mmmh... but creating a fleet of Microchip-building TS isn't a bit overpowered? Not ridiculous at all, it's just easier to script setting it via ship class rather than storage. Also I'm not comfortable with letting a single ship produce a large number of separate wares. The Terran Atmospheric Lifter has 60k storage! True. Initially I was going to limit it to fleet support (ammo & missile) however I thought why not just let the player choose. The minerals that require mines I have removed as that's just wrong. I know this flexible stance on wares contradicts the bit above where I've placed a limit on the number Modules, but I see that as a different issue. I've removed the prototype weapons as a selectable option. When you search these it returns a production time of 2 min from the Aldrin stations. why not making each module use up some cargo bay? for heavy machinery, fluff and stuff, it seems reasonable. someone else wrote: why not making each module use up some cargo bay? for heavy machinery, fluff and stuff, it seems reasonable. Adding as a Station is not such a bad idea unless you try and deploy it! Ware would also be good & cleaner than the station route. I would have to read-up on how to add a ware. the player goes and loads the TL buying a station from a shipyard (normal deployable vanilla station) and then your script recognizes it and automagically makes the station "work" inside the TL. He can deploy it when he wants... and it will work too. no new wares... so max compatibility with other mods at the less possible fuss, costs a honest price (it is the vanilla factory after all), and it occupies some cargo bay too! For TS there are some specific dummy wares that serve nothing... you could easily script on the TS a fixed amount of the Vanilla useless ware ("engine components" or "crates" for example) and make them inamovible (no idea on how to do that). From testing I think that won't work, the station won't work deployed and I'm not sure it returns any production values until it's deployed. I'll have another look into that once I've built this version. This is for beta to test it all works, it should do as the production script works on my LSDC and on the build version I have SSDN which now builds its own Drones (not yet released). Does this require normal loops to work ? For example, will making ecells require food1, food2, crystals and silicon to make ? I like the idea of all cap ships being able to make their own ecells. Say m7 and up. All the non-dockable ones at SPP's. Solves the supply problem once and for all. And given their size, they have enough surface area to obsorb sunlight from, same as an spp. You would need to have a cap on how many to have made at any time, or else your cargo by would fill up in your personal ship and not leave any room for booty. 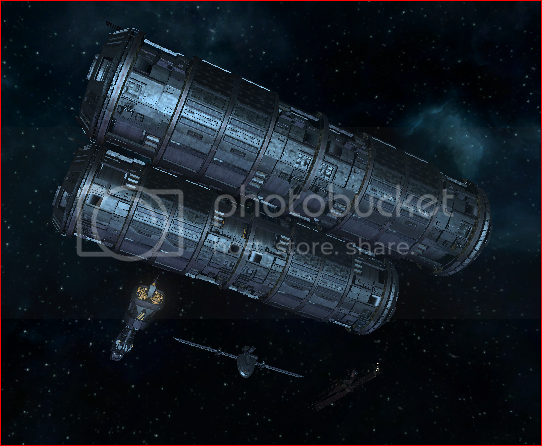 You could make a generic station that just occupies space and does nothing if deployed accidently. But this limits this to TL's only. apricotslice wrote: Does this require normal loops to work ? No it doesn’t require a loop; the one in the guide was an example. MPM will build anything (minus minerals & prototype weapons) as long as it has the resources locally, can get them via FDN or traditional supply routes. I was thinking of building a military version for my SSDN mod, the version I’m testing at the moment already builds Drone, I was going to add say 5 to 10 Modules for military hardware. I can setup MPM to work on both ships & stations; I’ll reserve a station command slot today.